Iron & Wine, Sufjan Stevens, and several more who sit a rung below on this particular musical ladder now have to make room to welcome William Fitzsimmons to the upper rungs, rungs which lead into the quiet introspective sky of this musical realm. Fitzsimmons music more closely resembles Sam Beam's (Iron & Wine) earlier uncomplicated work, whereas on Beam's latest effort (The Shepherd's Dog) Beam displayed a more surefooted confidence, on his early discs things were kept simple and some would feel, more pure. There is an honesty and purity to Fitzsimmons on this his third record, perhaps a bit too much piano though, as I think his voice sounds fantastic when set against the warm wood and metal of an acoustic guitar (or banjo), the piano being just too cold for him (maybe a quiet reedy organ would be a perfect fit for the next record). If I could climb cat-like into a big heavy leafed tree to curl up in a cool nook to sleep... this is the music that would be my drowsy purring soundtrack. 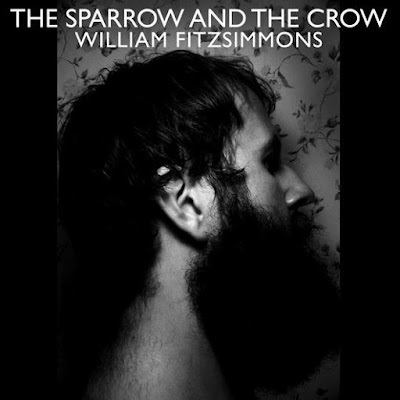 Released on September 30th, Fitzsimmons The Sparrow and The Crow offers 12 songs, of which "Goodmorning" stands out with it's lovely circular descending melody driven by the acoustic guitars.